I had a terrible dizzy spell in the library, went to get a sandwich, which didn’t help very much, so I swam back up Telegraph and as I passed the bagel place I saw that they were advertising their new chicken products with the slogan “WHY DID THE HUMAN CROSS THE ROAD?”which was awful, somehow it seemed to imply that the human-chicken relation in the food chain was entirely contingent and could just as easily go the other way. Stewart King once convinced me briefly that in the wild chickens grow to six feet tall. "Well," I thought, "Have I ever SEEN a chicken?" And on Friday we saw Rostropovich conduct an all-Shostakovich programFestive Overture, Piano Concerto No.1, Symphony No.5. There are those unexpected moments when the music turns transparent and you pass through it, suddenly hearing it from the inside as if the progress of notes composed your own body. During the final ovation, on Rostropovich's third or fourth return to the stage, he lifted the score itself from the podium and held it out for applause, and I felt capable of many things. I thought I understood the idea of a life's work. That's a coup of sorts! Oh, and today I finally got my bill from the Alameda County Superior Court for my jaywalking ticket. I love the goddamn mail. 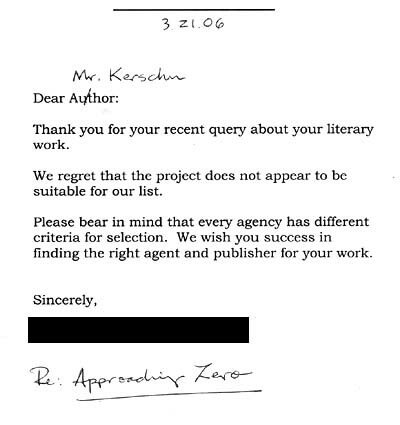 sorry about the rejection letter. reminds me too much of the ones snoopy always got for his novels. Oh, it's all rightthis is the tenth or so to come back. I just like their attempt to personalize it. Yesterday my little sister bought a house. Most of Joyce’s later opinions are not taken very seriously. Joyce was an alcoholic in those years, full of self-loathing; he was then working on one of the triumphs of the human mind and spirit, Finnegans Wake. I returned to that paragraph often when I was younger. I never quite understood the disjunction; it made sense for Gardner to describe Joyce’s sorry state as a human being, but why would he then switch to describing the triumph of the spirit in his book? Later it became clearer that Gardner must have been talking in part about himself, and that a basic trope of modernism still oppressed him as it oppresses us: the work of genius as redemption for squandered life. When I was very young it became clear to meor so I thoughtthat my life was squandered, and a short time later I ran across the first of many modernist artworks which seemed to offer a way out. Taking the fortunate chance to spend some time with old friends who are also writers, I had too much to drink and expressed something of this idea; and my friends, very sensibly, ridiculed me for it. And yet alternatives are elusive. If you find yourself too weak and selfish to make a supreme principle out of altruism, it can be hard to talk yourself into believing that your life is a good in itself. I think this is why, while the fiction has changed a lot over the years, it has always centered around aspects of myself that I dislike. I could stomach making a book out of something like the Guatemalan civil war only through creating a protagonist whose own involvement with the country was also damningly solipsistic. My sorry approximation to a moral life is the dramatization of my own moral failures. If we are truly playing for the risible stakes of posthumous recognition, then we hope to achieve it not through being exemplary human beings, but through meticulously recording the ways in which we fall short of being exemplary human beings. This post being a case in point. It’s hypocritical and repugnant; but it’s what we’ve inherited. If I can make but one fellow human being feel smugly superior to me, I have not labored in vain. The San Francisco Symphony's 2006-07 season is up. It’s an okay lineup (I think the 2004-05 season was the best of late): Michael Tilson Thomas is cycling back through Mahler, someone is coming to conduct Shostakovich’s Tenth, there’s a parade of hot violinists (Bell, Chang, Hahn, Midori), a lot of nineteenth-century stuff that doesn’t set my pants afire, some contemporary material (Astor Piazolla, Osvaldo Golijov, Thomas Adès, a John Adams premiere) that may. The twentieth-century selections include a lot of Stravinsky, and also Kodály’s Háry János suite; though the copywriters were careful about the diacritics, they also noted that the piece “proclaims a proud Czech heritage.” Any bets on how long they’ll take to fix that? As a young alum, I’m sure you have experienced a lot since your time on the Farm. The early years after graduation tend to be filled with many exciting achievements in your life and career. I want a source on that!